Need help with Sponsored Products? 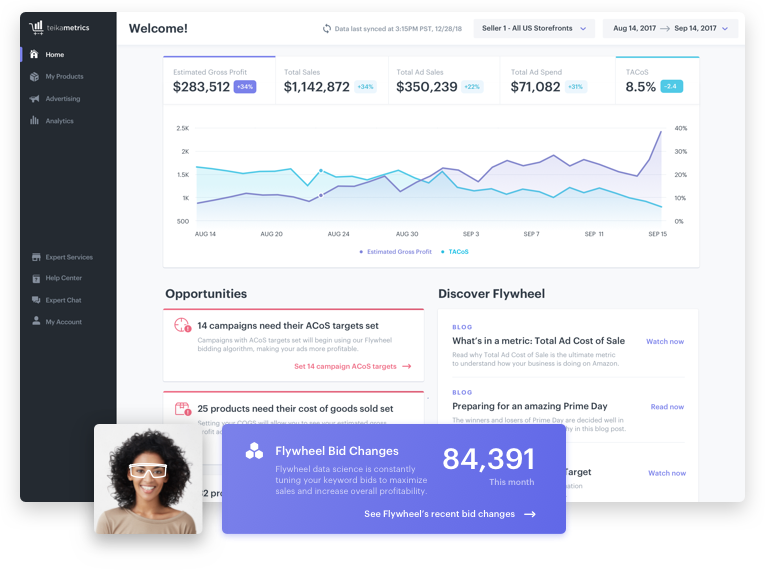 Teikametrics Flywheel ensures every advertising dollar spent on Sponsored Products goes to what matters most: growing your business and increasing profits. "In our short time working together, Teikametrics has increased our total revenue 53% while maintaining a constant ACoS within our budget thresholds. Beyond that, they are one of the single most helpful partners we have ever worked with." Say goodbye to archaic rules-based bidding, say hello to our world-class, machine learning optimization. See your individual- and account-level profitability, including fees, promotions, and advertising. Put an end to tedious keyword tasks. Leverage our automation to increase spend efficiency, sales, and visibility. Our team of experts is here to help. They’re ready to get you started and keep you profitable. Our metrics speak for themselves.